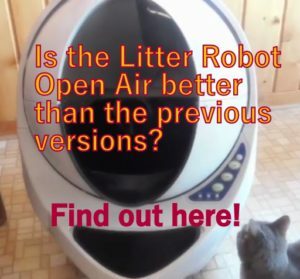 Cat Mate C3000 Automatic Cat Feeder Review - Suitable For Your Cat? (3.7/5) Cat Mate C3000 it is an automatic feeder with several features and mode settings. 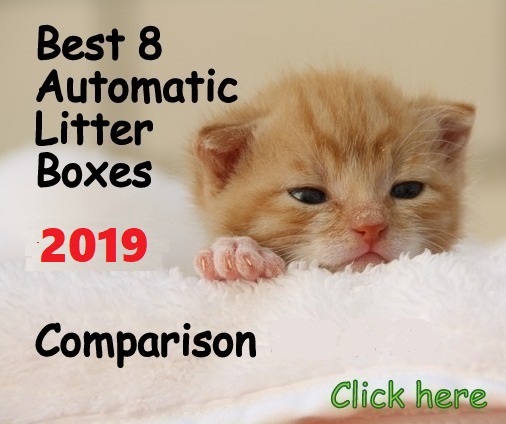 This review will give you a general description of the Cat Mate C3000, features, mode settings, pros and cons, and the final conclusion if this unit is recommended for your cat. We also include a video so you can see how this device works. 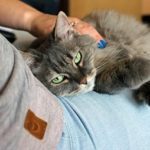 Note: If you like the Cat Mate brand and need to feed your cat wet food, check my review of the Cat Mate C500 that comes with ice packs. The Cat Mate C3000 allows you to program up to 3 individually sized meals within a 24 hour period with the ability to dispense each meal with a minimum of approx. 10 gr. (1/3 oz) at a time. 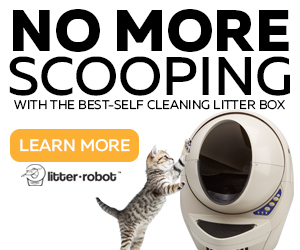 This automatic feeder is designed to work with kibble sizes between 1/4″ and 6/8″ diameter. For better accuracy in portions you may want to use 1/2″ diameter kibble size. The Cat Mate C3000 has a programmable LCD control to set clock and feeding schedule. 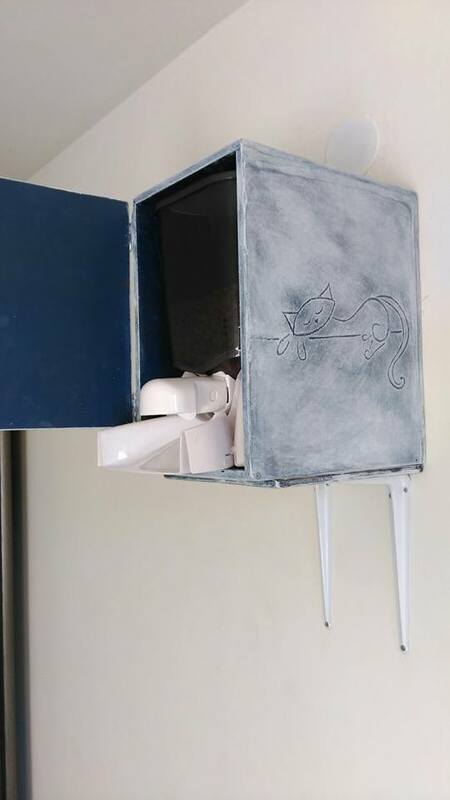 This automatic feeder has several mode settings to customize your cat feeding schedule. If you want to feed your cat more than 3 meals per day you can trigger an extra meal manually by pushing a button or you can program manually the extra meal. To feed your cat an extra meal you need to program this extra portion daily. Feeds up to 3 meals p/day. 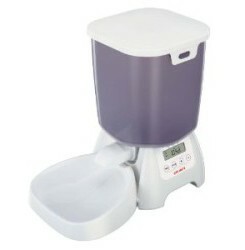 Capacity to dispense small amounts of food with minimum 2 teaspoons. Easy to program using the LCD control. Food hopper with a capacity to hold 6.5 pounds. May be attached to a wooden board for extra stability if required. It has a low battery indicator on the LCD screen. It works with 4 C batteries (not included). Extra feed (in addition to a Set Meal). 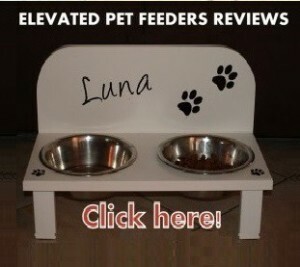 This allows you to feed your cat additional “feed units” (meals) than the 3-times-p/day feeding schedule. You can add one extra meal (entering 4 in total) or you can add more meals as well. These extra feed units have to be programmed manually daily. Advance feed (serving the next Set Meal early). With this setting, you can bring a programmed set meal forward. You may only advance feeding schedules programmed for the same day. For example, if you have set 3 meals p/day and you want your cat to eat the second meal earlier, you can do it pushing 2 buttons and the second meal will be served. After this, on the screen will flash the next programmed meal (3rd meal). Manual feed (dispensing controlled feeds on demand). This setting allows you to feed your cat a determined amount of food without programming meal times. Frequent feed (small feeds at regular intervals). 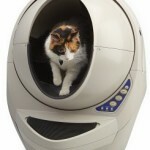 This setting is perfect for cats with specific dietary requirements (e.g. example, diabetic cats). The “frequent feed” allows you to set a determined amount of food to be dispensed at regular intervals you define within 24 hours. You define the “start” and “end” of this 24-hour cycle. The intervals are defined by how many times you want the food to be dispensed during that cycle. 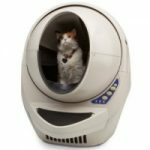 What are the Pros and Cons of the Cat Mate C3000? 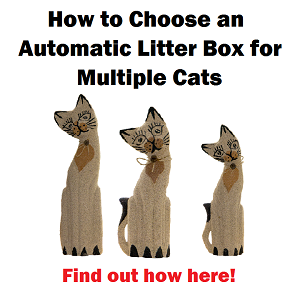 It allows you to feed your cat up to 3 times by day and you can increase the times manually. It allows you to customize the feeding schedule. “Frequent mode” special for cats that eat too much at one time. It retains the settings when turned off. You can change the batteries without reprogramming if you do it within 60 seconds. The dispensing is not accurate if you use small pellet (1/4″ diameter). Chute goes assembled with the unit, is not attached to it. A little tricky to be programmed. It works only with batteries. After setting the clock you have to wait 60 seconds before setting the feeding schedule, this is very important. 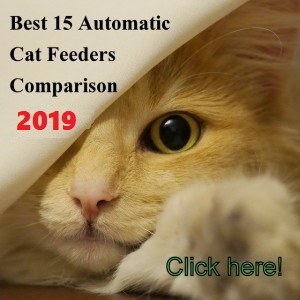 If you love the idea of getting this device but you have a cat very obsessed with food and you know it will try to defeat this feeder, you can check this great customer solution (US link) to use this automatic feeder. 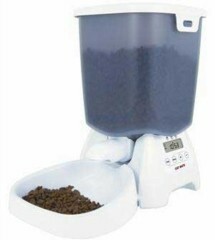 The Cat Mate C3000 is a good automatic feeder that works with accuracy when dispensing medium sized kibble. 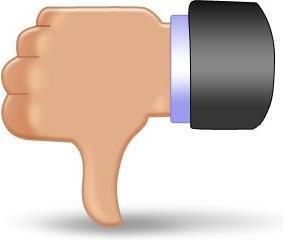 If you feed your cat with 1/2” diameter pellet size (better accuracy in portions). 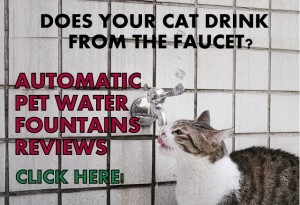 If your cat eats up to 3 meals per day. 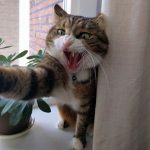 If you need to feed your cat a determined amount of food per day with regular intervals, using the “Frequent Feed” mode. If you have the patience to program this feeder (it takes time to figure out the programming). Your cat is well behaved with food, not a cat obsessed with food. You want to feed two cats. Your cat is not on a diet. If you don’t want to secure the lid of this feeder. Works fine once it is programmed. Programming takes about two hours at best; manual is not clear in how to manipulate the 4 buttons; much time is lost waiting to reset; never shure if the thing accepted the latest programming, switches to next step or not. It has one major similarity with my cat: unpredictable! would love to recommend it when a more precise and proper working programming/manual is available. Thanks Tom for you input. As one of the “Cons” states, the programming of the feeder is tricky. Once the unit is setup, it works fine. 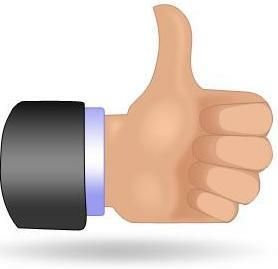 Remember to change the batteries within 60 sec to keep the programming retained. The programming took me about half an hour to an hour I think, takes some getting used to but very doable nonetheless. I placed a food enrichment activity board beneath it, a lot of kibbles will bounce off of it, but the few that do land there provide a little bit of extra challenge for the cats. Thanks Eve, for sharing your experience with us! Anyone knows how long it lasts the food on the container if feeding one single cat 3 times a day? More or less? Thanks! Hi mariana, if you feed your cat approx. 7 Oz of food a day the food will last about 2 weeks. Hope that helps! leaving tomorrow, i took to much time te check the batteries. I am unable to set my cat mate again. new feeder is missing owner’s manuel. Need help locating a copy of it. Hello Buck, you mean the motor is loud or the sound of kibble falling? Hello Parkerlene, once pushing the button “FEED” it should show the letter F and two zeros “F 00” for the next meal, if this doesn’t happen and you see the #6 instead you need to contact the customer service.